Sagunto LNG regasification terminal, located in Sagunto Port in the east of the Province of Valencia, has a total LNG regasification capacity of 6.4 million tons per annum. The plant started operating in 2006. The terminal is connected to the Spanish gas transmission network through a 7.5km natural gas pipeline. 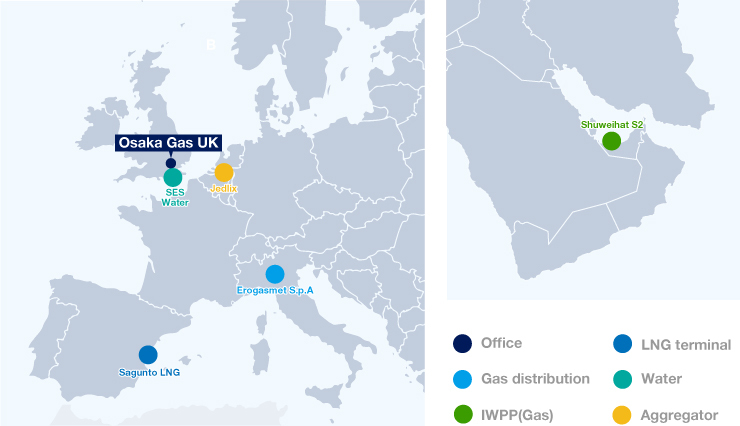 Sagunto terminal is a key gas import facility for the Spanish energy sector, providing major security to the national gas supply thanks to the diversification of the natural gas entry points. This is a plant with a net production capacity of 1,500 megawatts of electricity and 450 million litres of desalinated water a day, located about 250 km southwest of the Emirate of the Abu Dhabi. The asset started operating in 2011. Under the 25-years contract, all power and water production capacity will be sold to the Abu Dhabi Water and Electricity Company wholly owned by the governmental entity, the Abu Dhabi Water and Electricity Authority. SES Water, formally known as Sutton and East Surrey Water, is a water supply company, established in 1862, which supplies water to approximately 286 thousand households and businesses in the area of south-east of London. SES Water is engaged in the entire range of water concession services, including the maintenance and operation of water treatment plants, pipelines and other business assets, capital investment and customer services such as billing and cash collection. Erogasmet S.p.A is a gas distribution company with more than 50 years of history, conducting business in Northern Italy and the Rome area worth the equivalent of 256 thousand delivery points. The aim of the joint venture is to expand the current business by actively participating in upcoming tender procedures and to play a leading role in the expected industry consolidation process.